In spring 2014, Isaiah Tyree ’15 made a name for himself, literally, while trying his luck at soccer forward. Our team affectionately referred to him as “Torres,” after Spanish striker Fernando Torres, Tyree’s favorite player. Coach Jaws (Brian Jaworski) suggested that our team’s Torres make the transition from goalkeeper to forward during his senior season. “I had a tough previous season, and so my goal for my senior season was to have fun and recreate my love for soccer,” Tyree says. A full-time goalkeeper during his first three seasons, Tyree eagerly prepared to play forward, leaving goalkeeping duties to teammate Major May ’17. Throughout the intense preparation for his final chance at college soccer, Isaiah barely looked at his gloves, much less stepped between the pipes. With high hopes of a season to remember, we began our campaign with our alumni game. Passes looked crisp and the team was in shape. Then everything changed in one heart-stopping moment. A ball snuck past our defense. Major May charged in goal and collided with the knee of an opposing forward. With Major dazed on the sideline, Torres transformed back into our starting goalkeeper. After taking no repetitions in preseason, Tyree became the only healthy goalkeeper on our roster. As the season wore on, the shutouts piled up for Tyree and Grinnell’s defense. One day Coach Jaws announced that Tyree had achieved the best save percentage in the nation for NCAA Division III goalkeepers. Aware that we had the chance to accomplish something special, the team made it a point of pride to keep the ball out of our net. 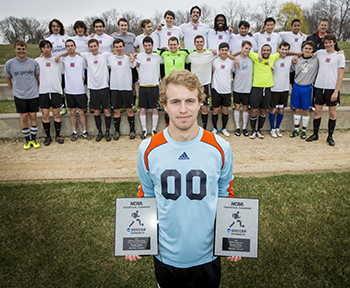 Grinnell did not allow a single goal in its final seven matches. In fact, Grinnell’s opponents went scoreless for the final 742 minutes of the season. While parts of the season felt like a fairy tale, the ending was a harsh blast of reality. Despite losing only three games, and winning or tying our last eight games, Grinnell did not qualify for the conference tournament. The season was over. Yet, the team achieved more than it could ever imagine in the record books. Tyree finished first in goals-against average and save percentage, after conceding only three goals all season. His save percentage of .959 was an NCAA Division III record and ranks second all-time among all NCAA divisions. With the help of the Back Bros, the team set additional records. The Pioneers established a new Midwest Conference record in fewest goals allowed with only eight. Team goals-against average was 0.44, fourth nationally. Grinnell tied the MWC record for shutouts in a season with 11. The most remarkable aspect of these accomplishments was the team’s process of getting there. From the bench erupting in applause each time the ball landed safely in Tyree’s gloves, to our backs eagerly willing to lunge in for a sliding block, it was apparent how much this meant to us. Grinnell College landed a league-best 286 student-athletes on the Midwest Conference (MWC) All-Academic Team for 2014–15. Grinnell led MWC schools in All-Academic picks during all three sports seasons: 112 selections during the fall, 99 in the winter, and 75 in the spring. To be eligible, students had to achieve a minimum GPA of 3.33 during the awarded academic year and letter in any of the conference’s fall, winter, or spring sports.